Those with low levels of mobility will often have to spend long periods of time seated in a chair or wheelchair, and this can introduce a risk of pressure sore development if the proper cushion isn't used. The Sidhil Serenade Gel Pressure Relief Cushion with Straps is designed to greatly reduce this risk, as it is made with pressure-relieving silicone gel that conforms to body contours for excellent weight distribution. 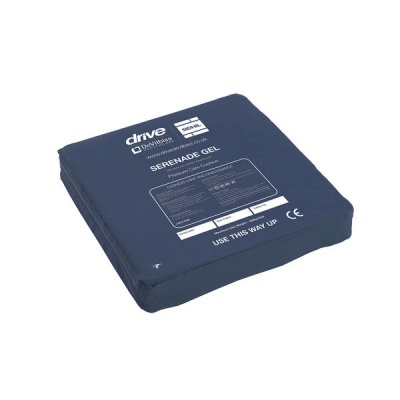 Supplied with a support strap to prevent forward sliding, this cushion is suitable for those at medium-to-high risk of pressure ulcer development. Gel is an excellent material for pressure relief, as it will naturally spread its surface area to maximise weight distribution. This cushion is made with silicone gel, which conforms to body contours to reduce pressure on key zones. Providing optimum support, this cushion is an ideal option for cushions and wheelchairs alike. This cushion is supplied with a protective water resistant cover, helping to protect it from spills and fluid. The cover features welded seams to prevent fluid ingress and increase durability, and is multi-stretch to reduce shear and friction forces on the user's skin. It is also vapour-permeable, allowing it to breathe to prevent moisture build-up and overheating. Please be advised that the Sidhil Serenade Gel Pressure Relief Cushion with Straps is usually delivered within 1 week of your order being placed. We would advise you to consider this delivery estimation before placing your order. For more information, please contact our Customer Care Team at 020 7501 0592.